Welcome back to our bimonthly celebration of women who travel solo, showing that solo female travelers come from all kinds of backgrounds and have many unique stories to share. Today I’ve invited Somto, originally from Nigeria, to share her story about being a solo female traveler, the difficulties she has faced as a woman of color on the road, and the benefits she’s experienced from traveling on her own. I was born in a small city in eastern Nigeria. For the first ten years of my life, I lived a conservative lifestyle centered around family and church. I attended a military-style Catholic school, where all the teachers were nuns. The nuns, ironically, were merciless and enforced order through spanking. Outside of school, I served as a flower girl at lots of weddings and went around the neighborhood picking tropical fruits. One day, my mom miraculously won a visa lottery to America and was granted a green card. In 2001, my family moved to Los Angeles, where I experienced a major culture shock. I was surprised that my 5th grade classmates had boyfriends and wore nail polish. At my school in Nigeria, wearing nail polish was a serious offence that would get you at least 25 lashes. Having a boyfriend at 10 was unthinkable. I couldn’t connect with my new classmates. Most of the time, I had no idea what they were talking about. During my first Halloween, one girl excitedly asked me if I was going trick-or-treating. ‘Trick-o-what?’ I asked. Unable to make friends, I quickly developed depression. Being a perfectionist and collecting accolades became my primary coping mechanisms. Throughout grade school, I put my head down and focused on being a top student. I hoped that I would find happiness one day. As a young adult, life threw some curveballs at me. I applied to over 200 jobs after college and was rejected by all of them. When I finally found a job, I was let go after three weeks. My next job lasted 4 weeks. Feeling like a complete failure, I succumbed to severe depression. The silver lining is that the experience forced me to rethink my values. I stopped focusing on collecting accolades and impressing people. Rather, I started focusing on self-care and happiness. After working for a year as an AmeriCorps volunteer in Washington DC, I moved back to my beloved Spain to teach English. My parents, who are strict about education, wanted me to be a doctor. When I got to college I realized that medicine wasn’t for me. Instead, I studied international relations and took advantage of travel programs offered by my school. It was during an internship in China that I discovered the euphoria of travel. I went to the Great Wall and was completely blown away. Being black in China, I was almost like a celebrity. People would point, stare, and ask me for pictures every single day. It was flattering and irritating at the same time. After my experience in China, I made travel a priority, studying abroad in Spain and exploring America. I traveled alone for the first time in 2015 when I moved to Spain to teach English. Craving adventure and longing to return to Spain, I booked a one-way ticket to Madrid. I wanted to see the world and didn’t want to wait for people anymore. Once I arrived in Madrid, I found an apartment within a week and settled in. With Madrid as my home base, I traveled solo throughout Europe for almost a year. How did you persuade your parents of your lifestyle choice? My family is actually very supportive of my current lifestyle. Living in America has made my parents gradually become more open to non-traditional lifestyles. My mom is currently helping me reach out to different Nigerian groups in LA to promote my blog. At the end of the day, she truly wants me to be happy and will put aside ideology if necessary. I think the key factor in convincing my parents about my new path was having a plan. Nigerians don’t like uncertainty so I’ve had to demonstrate the concrete steps I plan to take and the outcomes. I did a ton of research and took several courses about the business of travel blogging. I attended business seminars. Recently, I hired a business coach to develop a road map for my blog. Doing those things sent the message that I was serious. It assured my parents that blogging wasn’t some fluffy hobby. Have you ever faced any challenges traveling alone as a woman of color? While traveling solo in Dubrovnik, Croatia, I was stalked by a middle-aged man who said he liked ‘dark-skinned ladies.’ He followed me around for two days and even showed up next to my hostel! As a woman of color, I have to be careful when traveling to places that don’t receive many black tourists. People there may find me exotic and prey on me if they see that I’m alone. I’ve experienced racism on many occasions while traveling, especially in Spain. I was denied service at a tapas bar in Valencia. The waiter gave me a dirty stare and went on to serve other people. I try not to dwell on such experiences because I know there are people with prejudices everywhere. Instead, I focus on what led me to visit the place, whether it be food, art, beautiful scenery, or a number of other things. My travel experiences have been overwhelming positive. In Japan, for instance, a stranger walked me to my hostel when I was wandering around lost. In Paris, a Danish man bought me a train ticket when I was trying to figure out how to work the machine. I’ve experienced far more kindness than hostility. Solo travel has shown me that. What’s your best advice to other women of color who want to travel alone? Just do it! I was scared out of my mind the first time, but solo travel has truly transformed my life. I have developed so much confidence in myself. It was almost as my biggest anxieties and self-limiting beliefs vanished overnight. I’ve been so empowered that I quit my job and started my own business! Traveling alone can help you become a stronger version of yourself. You don’t know what you’re capable of until you try. I used to think that I was useless at finding directions, but I navigated my way around the Mediterranean for 22 days. Don’t let fear or doubt stop you from seeing the world. Galicia, Spain is an underrated place that is perfect for solo female travelers. Located on the northern coast of Spain, the region is home to beautiful beaches, vast flower fields, and the best seafood I’ve ever had. Santiago de Compostela, the last stop of the famous Camino de Santiago, has an entire street, Rua Franco, just dedicated to seafood. If you’re not into seafood, you can find lots of other Spanish dishes and vegetarian options. Also visit the Tower of Hercules, just about away in the city of A Coruna. The wind is intense there so be careful. You can get some amazing pictures with the tower and the flower fields in the background. The biggest obstacle I’ve had to overcome is going against Nigerian tradition. Nigerians typically choose careers in medicine, engineering, law, or academia. My dad is a doctor and my mom is a professor. My older brother is also a doctor. I was supposed to pursue medicine but quit after one semester of pre-med. Even after giving up on medicine, I still felt the pressure to choose a ‘serious’ career. Travel blogging isn’t something most people would consider a serious career. Most people don’t understand how travel bloggers can make money. I’ve had to convince my parents that blogging is in fact a viable career choice. Not only that, but I’ve also had to convince myself. Pursuing this path was quite scary, but sitting in an office for 9 hours is scarier. In addition to that, I’ve had to be creative to fund my travels. I took a 3-day trip to Budapest and paid 186 euros total. To afford this travel lifestyle, I’ve had to master the art of travel hacking. I’ve also had to cut back on spending in other areas. It requires discipline, which I learned back at my elementary school in Nigeria. Be My Travel Muse encouraged me when I had doubts about traveling alone. I would read the stories of other female solo travelers and feel more at ease. I could relate to a lot of their doubts and fears. It was also great to find a community of travelers with the same fervor to see the world. Wow, what an incredible story. I hope Somto’s journey will inspire you to believe in yourself and do what’s best for you. 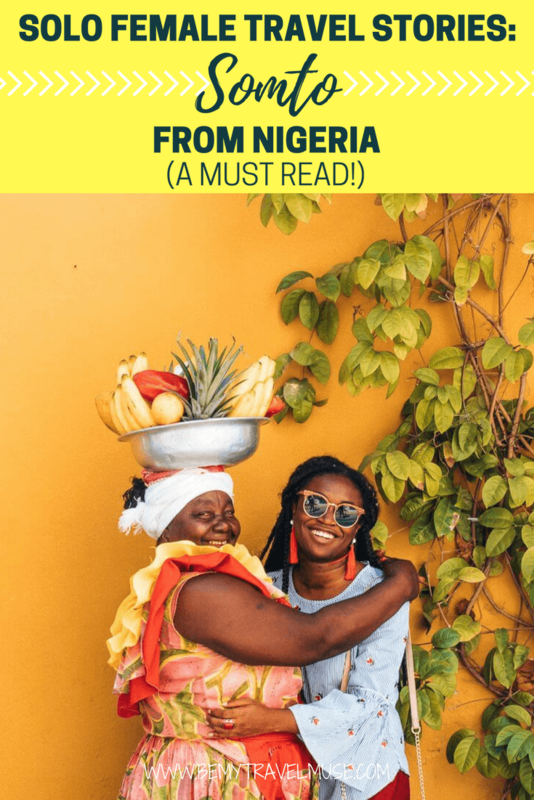 To read more about Somto’s travels, check out her blog, Somto Seeks, which focuses on helping millennial women of color experience the freedom of solo travel. Thank you so much, Somto, for sharing your story with us! Want more? Click each name to read her story: Thia from Indonesia, Wangechi from Kenya, Archana from India, Heather from California, and Julie, a not so young woman abroad.